The Series 24 is a cast-iron water or steam boiler designed for use with light oil, gas, or a light oil-gas combination. The Series 24 is designed for installation with either a standard chimney or a pressurized vent system. 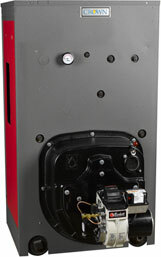 The boiler has a swing-open front door for easy service and inspection.